The Ethiopian Orthodox Church has elected a new head six months after the death of the previous patriarch. 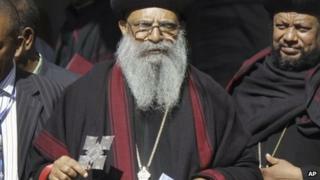 Abune Mathias, 71, will be enthroned in the capital, Addis Ababa, on Sunday. He has been serving as archbishop of the church in Jerusalem and has lived abroad for more than 30 years, first going into exile after the coup led by Mengistu Haile Mariam in 1974. He will lead Ethiopia's 40 million Orthodox Christians - more than half the population. His predecessor, Abune Paulos, was chosen to lead the church in 1992 - a year after the overthrow of Mengistu's communist government. Ethiopia's Orthodox Church used to be part of Egypt's Coptic Christian Church, but got its own patriarch in 1959. Abune Mathias will be its sixth patriarch. Tens of thousands of people are expected to attend his enthronement following his election on Thursday, the AFP news agency reports. Ethiopia has some of the word's oldest churches, including rock-hewn churches, which are a World Heritage Site, in Lalibella in northern Ethiopia.